These sturdy steel DIN rail mounting brackets are useful for mounting a wide variety of devices onto standard 35 mm DIN rail. They feature a flat mounting surface and pre-drilled mounting holes, which, depending on the model, are threaded and/or unthreaded. 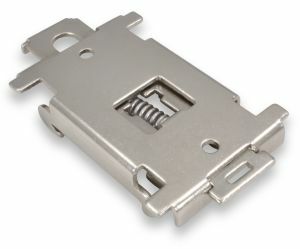 These brackets very easily attach and detach from a DIN rail while maintaining high rigidty and load capacity: the bracket latches onto both the top and bottom lips of the rail with the fixed (non spring-loaded) end of the bracket on the top of the rail to bear the weight of its device. We also offer a Right Angle version which can save significant DIN rail space by mounting devices perpendicular to the rail. 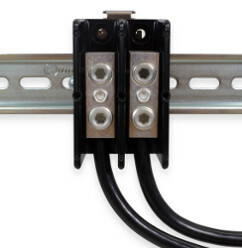 As shown in the images below, the width of the bumper impacts how much space exists between the bracket and the DIN rail. Brackets with a larger bumper have a smaller rail clearance, while brackets with a smaller bumper have a larger rail clearance. 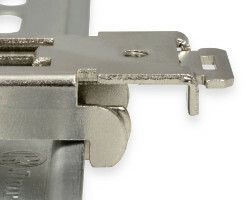 A smaller rail clearance restricts movement of the bracket on the rail, making the assembly more rigid for unusual side loading or rotational forces. This can be helpful, for example, when dealing with arrangments that have unusually stiff cables. 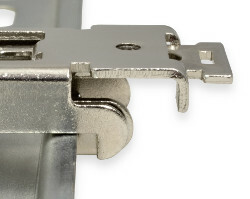 To remove these brackets from a DIN rail, either pull the release handle from the bottom edge of the bracket, or push the handle down from the top edge of the bracket. 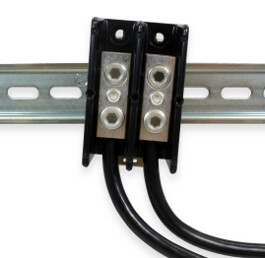 This releases the sliding hooks that grip the bottom of the rail and allows the bottom edge of the bracket to swing out away from the DIN rail. The entire bracket can then be lifted off the DIN rail. Because these models have less rail clearance, the release handle must be actuated in order for the bracket to be able to move far enough away from the rail to detach. For this reason, the lift and pvot method will not work. You can also use the release handle to remove these brackets from the rail. A simpler method, however, is to push up on the mounted device, pivot the top of the device out away from the rail, and lower the entire device off the rail. This technique is possible because of the larger amount of rail clearance, and does not require access to the release handle which makes this method easier. The DINM20 has two and the DINM24 has four unthreaded 4mm diameter mounting holes. The holes in this bracket can accommodate M4 machine screws, #6 machine screws, or #6 sheet metal screws. Please note that the M4 hardware (sold separately below) will not work well with the DINM20 clips if the screw heads are located on the bottom side of the clips. The DINM21, DINM23, DINM23LR, and DINM24 contain M4 threaded mounting holes. Winford offers M4 machine screws (sold separately below) that work well with these clips. 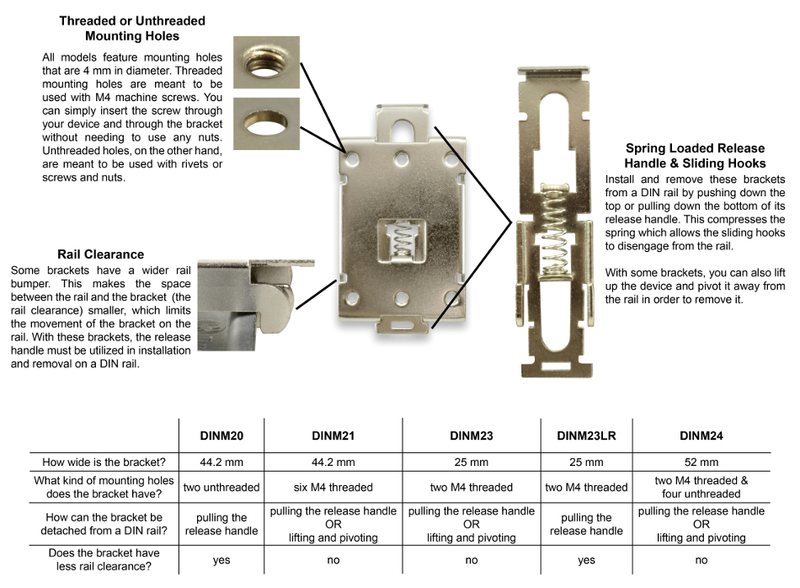 We offer metric mounting hardware for the threaded holes on the DINM21, DINM23, DINM23LR, and DINM24 clips.